The name garnet may come from the Latin 'granatum', meaning pomegranate. The red flesh of the pomegranate is similar to the colour of many garnets, although green, orange and brownish garnets can also be found. 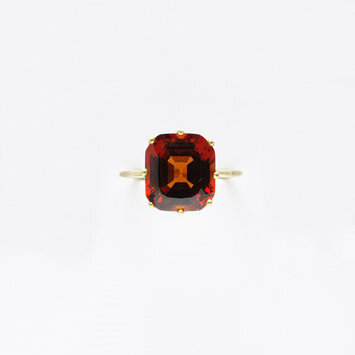 This ring is set with a red hessonite garnet. Some of these, including this stone, were originally owned by Henry Philip Hope, a brother of the novelist and antiquary Thomas Hope. H. P. Hope formed a famous collection of diamonds and precious stones which was largely inherited by his three nephews. His collection included the Hope blue diamond, now in the Smithsonian Institution, Washington. Hessonite garnet, oblong with rounded corners in a gold coronet mount. Hessonite garnet set in gold ring.